XKCD casts epic necro on Catonakeyboardinspace! YOU KNOW WHAT? I LIEK THIS SITE SO MUCH, I MIGHT NAME MY ACCOUNT AFTER IT! HAHAHAHAHAHAHH. Nice random stupidity. And the no spaces works. Cite sources though, or at least say internets. I hope i die soon. It's so random, I love it! Not U&C material, but then again what is these days...... CURSE YOU YTMND! DO NOT CITE SOURCES FOR SOMETHING LIKE THIS. ""Don't say internets for a source or death shall come swiftly"" Impossible! The ridiculousness is outweighed (or perhaps enforced) by the awesomeness. I was gonna 4 this until I saw the URL. lol I just read the sites domain name. Wish I could change my vote to a 6. Hey, Poland is going to adopt this as it's nationwide religion. the music is what makes it. A reminder: After the new update, a comment like this jackass made shouldn't appear. that kitty looks like mine. why is this so high in the up and coming? I love it. i can sense it. this has the ability to become a ytmnd classic. NOOO! SPACE CAT GET OUT OF MY HEAD! Relaxing and awesome, though it needs kitties. The music goes hand in hand with this. I feel I need to favorite this, and I dont know why. CoaKBiS FTW! No? Ok yeah, no. Sweet, I can't wait to die! Is it attacking Earth with its evil 60's music rays? 5. And I'm not sure why. Second comment, but it really deserves as much win as it can get. Maybe its the cat's expression, or the crazy music that remind me of that PBS show with the crazy astronomer that always tells me to look up at the skies. I don't want to see the waxing moon, I want Venus! I'm Jack Horkheimer! KEEP LOOKING UP!!!!11oneone1!!11!!!!! The cat is highly desireable to me. i found my new religion. I've been watching this for over an hour and I've decided that this is the epitome of humanity's achievments. This is the physical embodiement of pure greatness, plain and simple. I have been more than enlightened by this, thank you. HAHA I love it! So simple yet so funny. In the year 20XX, long after the burning cat wars, human civilization has finally attained world peace. But a new evil has risen... and a hero to stand against it. Mankind's only hope: Happycat X. This summer-- Not Even Doom Music will save you now. Coming to a YTMND near you. if i were reassured that would be what I see when I die, I'd kill myself instantly. How could anyone not 5 this? Love the domain name. The most awesome thing ever. Lucky cat. for some reason unknown to me this just wins. Cute ^.^ Looks like he could be saying/thinking: "GTFO,Scientology"
5 for the ARP Odyssey. Also, NEDM. Pretty funny, but only 3 stars worth of funny. lol @ Verge. Funny randomness. Made my day. Especially after my cat died not to long ago. I swear, you could have made the site blank. The music is 5-star worthy by itself. this ytmnd has got me looking forward to death. cat on a piano in space... here i come! btw, best picture/sound combination evar! Top 5 material, Id go so far as to say..Hall of Fame, you know what I mean? Addicting music and wtf factor! Noooooooooo! I can't resist! i prefer cats in sinks but this is still great. This is the kind of retarded sh*t I want to see when I log on to the internet. A wonderful nonsequiter. I approve of this completely random yet amusing site. No obsenity and the musical choice is just great. This ytmnd delivers what it promises. Good show. screw it, i'm faving this. i love it. I registered just to comment on this. Very nice. I haven't been this amused in a long while. omg, this is exactly how my mind works. When I die, I hope this is what I see! Oh great, another site with a cat. 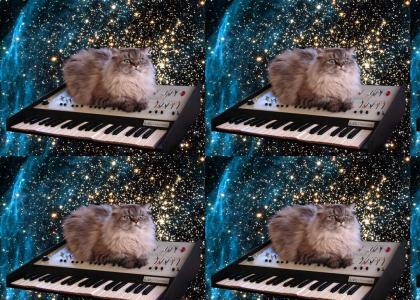 lol, kities in space with keyboard music! Catonakeyboardinspace owns joor Jesus!1 U peepzors. You couldn't be more wrong. Enjoy your dull life. I'm not that impressed, sorry. f*ckin great i LOVE IT FIVED FAVORITED EXPLODED! This is the most original YTMND in the history of earth. Complete randomness is what YTMND was originally all about. Good work. First vote of 4, but the after time, the music and how content the cat looked scored you a 5. 5 for the address. "what you see when you die" rofl rofl rofl. The strangest YTMND since Space Hat. i can't wait to die now! This is what i see when i die? Now I'm not scared of death anymore! lol. Glorious, this ytmnd should become a classic. I could compare the symbolism and power of this ytmnd to such literary classics a Beowulf and The Cat in the Hat. Everyone's day could use a little more space cat. "could it be anything more?" *click* "nope"
hahaha nice nice. "what you see when you die." you win. This makes me happy in my pants. 5* for happy, -6* for pants. exactly what it says it is! also love the domain. Haha if you could get the Space Camp song for this, it would be sheer win. 5 nonetheless. You can't fool me - cats can't play keyboards ! Well, not in MY band, anyway ! This could be a new religion... and it makes a hell of a lot more sense than scientology. When I eventually die, if I see this, my spirit's gonna laugh its *ss off. I lol'd so damn hard. good work.